Open living concept with soaring ceilings, 4 BR and 4.5 baths. This home features custom countertops and numerous upgrades including, stainless steel grill, refrigerator, sink, lots of storage space, and under-counter lighting. Inside this custom designed home, you'll find special architectural elements such as, artistic columns in the elegant dining room, custom closets in the master bedroom, and in the room used as an office, custom built in cabinetry. An energy efficient and nearly maintenance-free saltwater pool package consists of award winning, PEBBLE TEC flooring with wireless animation, firebowls, firepit and the outdoor lanai features a large Picture Window Screen. 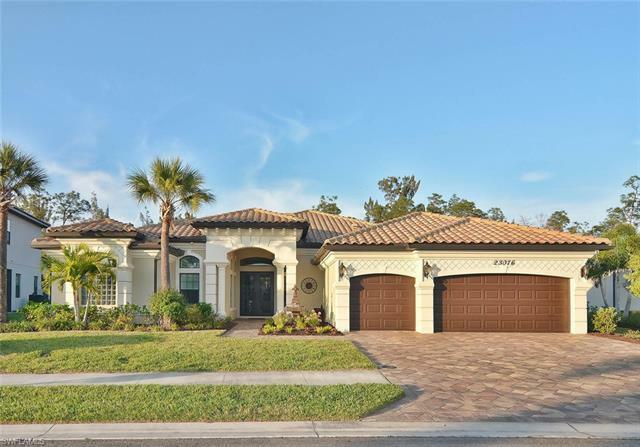 Lush landscaping, professional lighting borders the lanai making it the most attractive entertaining lot in this Bonita Lakes community, centrally located near the Ft. Myers (RSW) airport, beautiful beaches, convenient shopping, sporting events, golf courses, and downtown Naples. Owners have hosted multiple charity events in this dreamy outdoor living space with over 100 guests, complete with caterers, servers, photographer, and live entertainment around the spacious pool and firepit seating area. © 2019, The data relating to real estate for sale on this Website come in part from the Broker Reciprocity Program (BR Program) of M.L.S. of Naples, Inc. Properties listed with brokerage firms other than Royal Shell Real Estate Inc are marked with the BR Program Icon or the BR House Icon and detailed information about them includes the name of the Listing Brokers. The properties displayed may not be all the properties available through the BR Program. BR data on this website is provided by Royal Shell Real Estate Inc on behalf of Deb Adams Bateman. The source of this real property information is the copyrighted and proprietary database compilation of the M.L.S. of Naples, Inc. Copyright 2006 M.L.S. of Naples, Inc. All rights reserved. The accuracy of this information is not warranted or guaranteed. This information should be independently verified if any person intends to engage in a transaction in reliance upon it. Data last updated 2019-04-26 04:43:56.